Scientists have come up with a potential new weapon in the fight against malaria, a compound that causes the disease-causing parasite to literally burst. Announcing the discovery in the journal Nature Communications Tuesday, the international team led by Drexel University's Akhil Vaidya said they have discovered a new class of drug compounds that inhibits the malaria parasites' ability to maintain adequate levels of sodium within their cells, leading to excessive water intake. When exposed to the drug, the parasites, which invade human red blood cells, fill with water in an attempt to balance the unregulated accumulation of sodium. "The parasite gets swollen, bursts and dies," Vaidya told CBS News. Malaria is the world's deadliest parasitic disease. It is caused by Plasmodium parasites that spread to people through the bites of infected mosquitoes, causing symptoms including chills, fever, vomiting, seizures and sweating. Every year, there are 300 million cases of malaria and 600,000 people die annually. It long has been a scourge among developing countries Africa, Asia and Latin America but in recent years it is turning up in places like the United States, thanks in part to climate change. 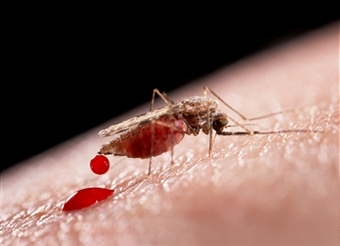 One of the biggest challenges for treating malaria is drug-resistance. Several drugs have suffered this fate including artemisinin which is derived from sweet wormwood. Resistance to the drug was recently discovered in five Southeast Asian countries and possibly in South America, which prompted the World Health Organization to warn that "resistance to artemisinin is an urgent public health concern, threatening the sustainability of the ongoing global effort to reduce the burden of malaria." "It's difficult to come up with a treatment," Vaidya said. "Chloroquine was a fantastic drug for several decades but it lost its efficacy. Now, we need to have new drugs that have to be developed. You have to continuously develop them because resistance will come about because it is fact of biological evolution." But there is reason for optimism, Vaidya's said, given his team's compound is just one of several recently discovered that could lead to new drugs. "The pipeline for anti-malaria drug has never been better," said Vaidya, who has studied malaria for a quarter of a century. "It's quite robust now. There are several drugs in the pipeline in different stages," he said. "There has been increased investment from academic and industrial partners. Some of the pharmaceutical companies have invested significant amount of their resources to develop anti-malaria drugs." This summer, Swiss pharmaceutical giant Novartis announced that one of its malaria drugs, KAE609, successfully cleared the mosquito parasite from 21 infected patients in just 12 hours. One of two new classes of antimalarial compounds discovered by the company in the past four years, it works in a similar way to the one discovered by Vaidya's team, but it has a different chemical structure. "KAE609 is a potential game-changing therapy in the fight against malaria," Thierry Diagana, head of the Novartis Institute for Tropical Diseases (NITD), said this summer. "Novartis has given KAE609 priority project status because of its unique potential of administering it as a single-dose combination therapy." At the same time, researchers last month announced another novel approach that would make life difficult for the parasite residing inside the mosquito. They discovered a microbe, Csp_P, isolated from the gut of an Aedes mosquito, which was shown to kill the malaria parasite. Writing in PLOS Pathogens, George Dimopoulos and his colleagues from Johns Hopkins University said the bacterium likely does the damage through the production of toxic metabolites which could potentially be the source of future anti-malaria drugs. For his part, Vaidya acknowledged it will still be years before his team's compound actually leads to a new anti-malaria drug. But of the millions of compounds he and his team screened in search for a viable lead, this was the one with the most potential.